For this post you might want the children to leave the room. Two of my chickens are doing something weird. I skipped over the rooster/breeding/hatching sections of all my chicken books because I didn’t think there was any info in those sections that I needed. 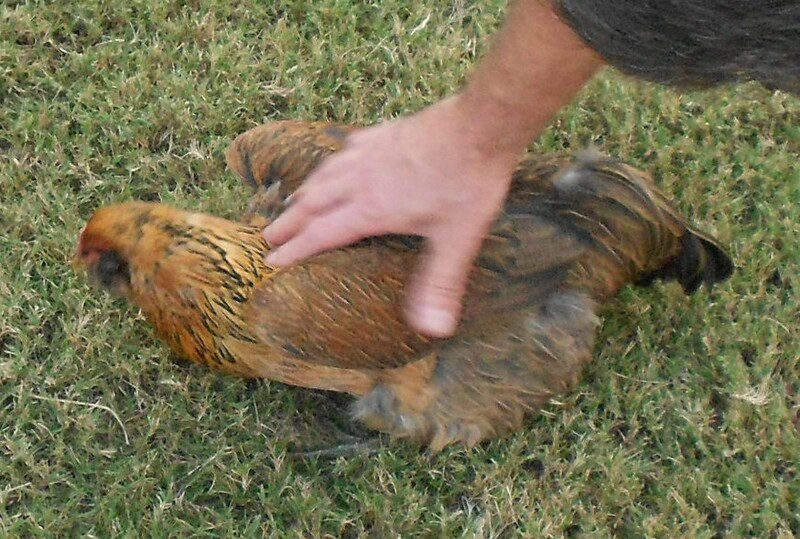 I never intend to invite a rooster in our yard for a “date” with any of the girls. There is, however, some behavior that would have been explained if I had read further. Rosie and Violet “squat” down recently when either Jim or I bend down to pet them or try to pick them up. The first time I saw this move was about a month ago when I reached to grab Rosie. She squatted and flared her wings out slighty and slightly lifted her tail. Her body was rigid and she was motionless when I picked her up. At the time I thought maybe she was just scared of me or perhaps she just had a spasm. She did this several more times during the next few weeks and now Violet is doing it too. It’s hard to see in this picture, but I tried to take one of Rosie doing the squat when Jim reached down to pet her. It looks like he’s squashing her with his hand but that’s really just her body hunched down as far as she can get it. This photo of Violet is even less clear, but I tried to capture the “squat” move with my camera. We looked this weirdness up on the “intra-web” and found several comments and explanations on the chicken squat. 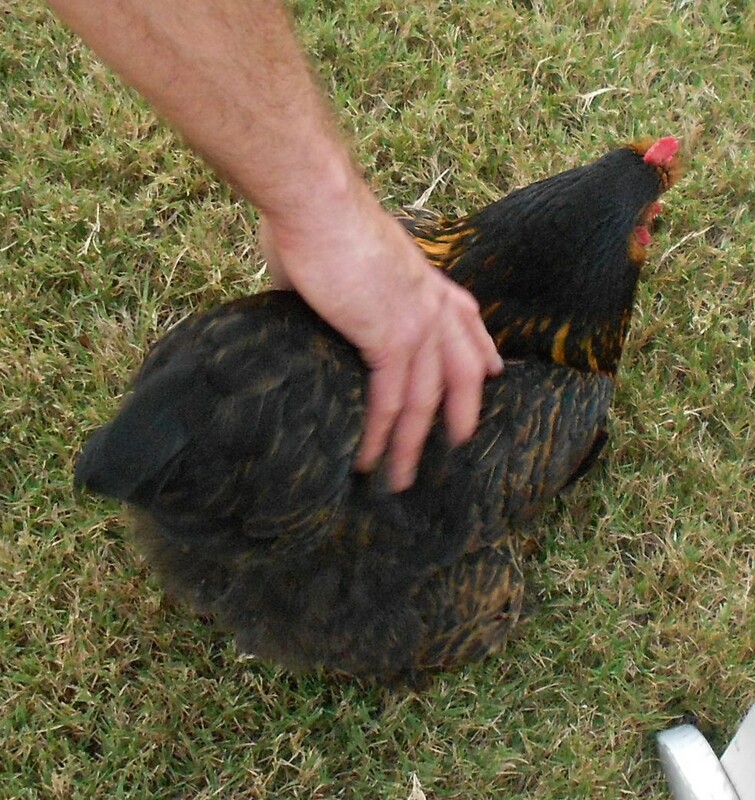 The general consensus is that this is a pose of submission by a hen. She is “inviting” the rooster to come hither. (I told you to get the kids outta the room!) 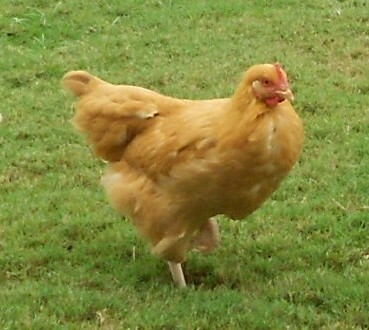 When you have a group of hens and no boyfriend to keep them company, any superior chicken is perceived as a rooster to them. In other words, Jim and I are the top chickens and the ladies react instinctively to our hands on their backs as they would to Mr. Foghorn Leghorn making a move on them. It’s actually kind of cool trick and it makes it very easy to pick them up. You just have to sneak up from behind, pet their backs, and over half the time, they go into squat position and stay there for a few seconds rigid and motionless. Our little Daisy is not exhibiting any of this grown-up behavior which leads us to believe that she will be the last to mature and lay eggs. That’s fine with us. Daisy had a rough start in life (Near Tragedy, May 18th) and she needs a little more time to be a chick before she becomes a woman. We look for Miss Violet to be our next layer. Her eggs should be bigger than Rosie’s and will be dark brown. Meantime Miss Rosie has layed seven small blue/green eggs in seven days and they have all been perfectly formed. I’ve only gotten to taste one so far because I’ve been saving a half-dozen for Tama. After today she will have her prize and Jim and I will hoard our eggs for a while until we have enough for a good omelette! I do declare….this diary is becoming X-rated. Intended for mature audiences only! Now go eat your banana bread! Those chickies better get down to business.. There are some hungry people here in Purvis waiting on eggs come Sept 30th!!! Sorry. Rosie is doing her best. Violet & Daisy don’t care if Renee goes hungry! I just love that Rosie! I can just see her strutting around with the “Yeah, that’s right! I am the one feeding the family” attitude. She does have a certain strut. You have to have confidence when you’re a chick with a beard! chickmommy, I love your post. You and your little chicks are so interesting. Who knew—Chicken Squat. Linda, come walk the quarter mile to my house and see them squat for yourself. I need a picture of Jack holding one of my chickens!